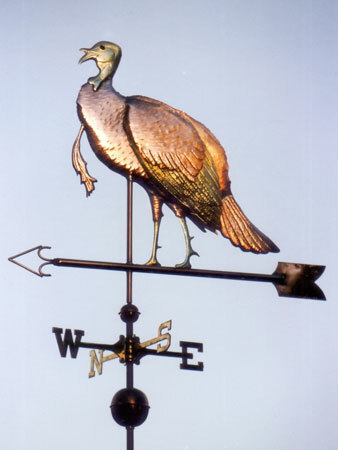 The Chanticleer Rooster Looking Back Weather Vane, Gallus gallus domestics, featured here was crafted in copper and brass with optional gold leafed accents. 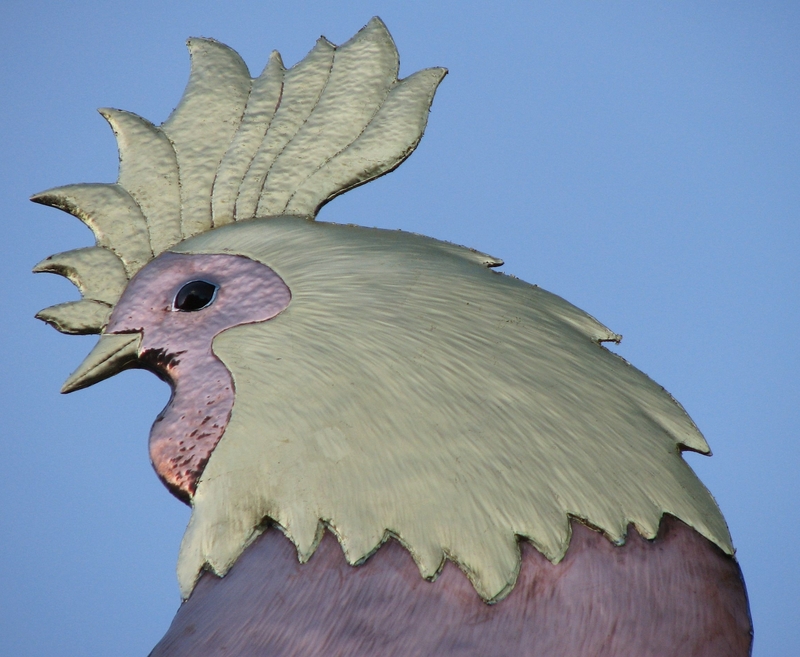 The rooster’s comb, beak and tail feathers are brass and we gilded the his neck ruff and legs. 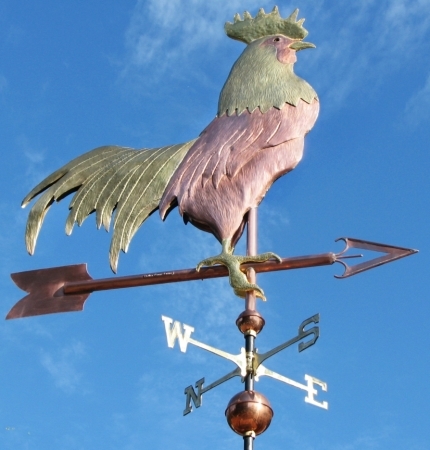 We have constructed this rooster with red eyes and yellow eyes, depending on our customer’s preferences. In many Asian cultures, the rooster is a symbol for prosperity and good luck. 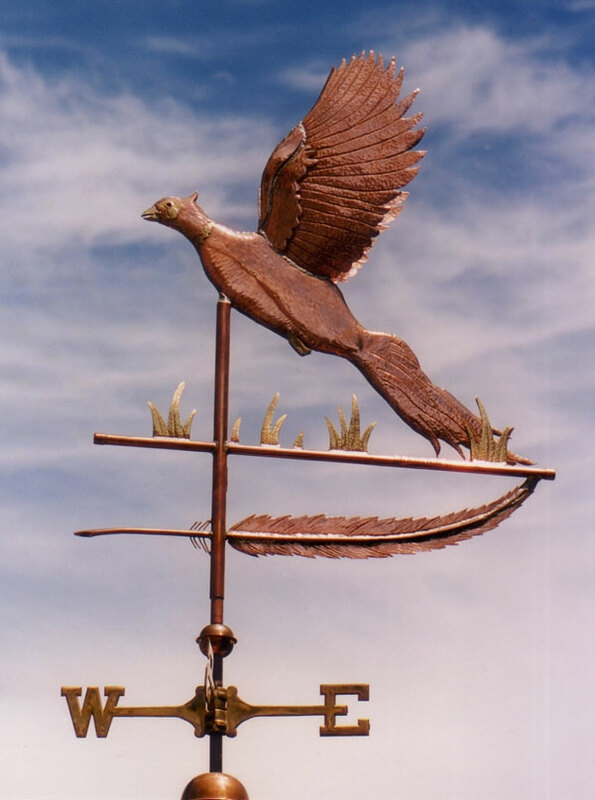 We recently finished one of these weathervanes as a wedding gift for a couple in Malaysia. 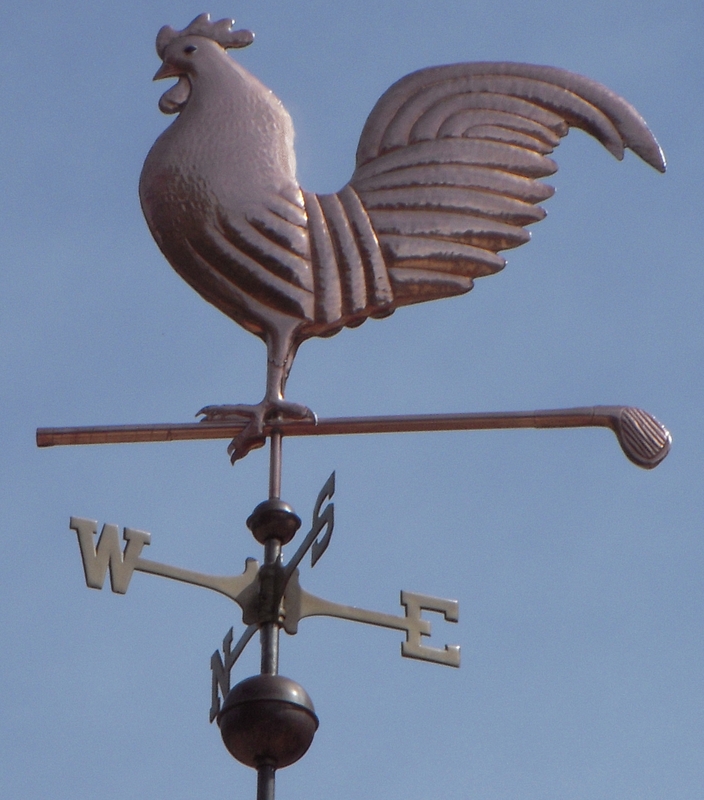 Due to the rooster’s rich symbolic appeal in many different cultures, it has been popular as a housewarming gift, birthday present, anniversary gift (the seventh anniversary is the copper anniversary), and Christmas present. 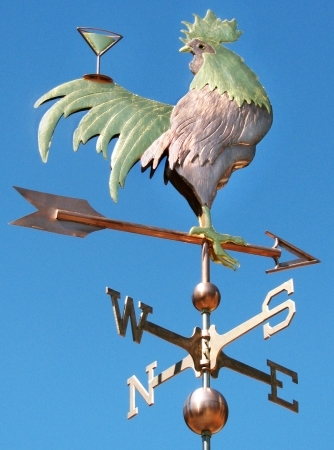 In our first years of business, we took a lot of kidding from our weathervane making counterparts back East for already having over fifty designs (at that time) but still no rooster weathervane. 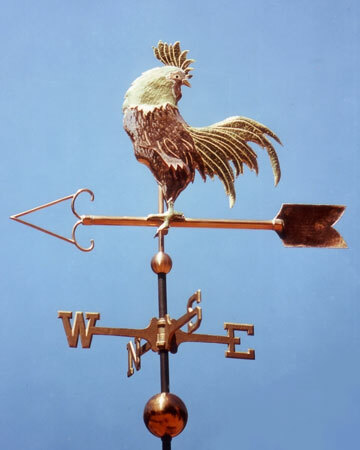 But, as Rooster weathervanes are so commonplace, we wanted to offer a version that is a little different than the status quo. I bided my time in designing one until I felt I had a really good idea. One weekend my husband, Ken, and I were visiting the Asian Art Museum (a truly remarkable museum if you are ever visiting San Francisco) and saw a wonderful exhibit of Zen paintings. There in front of me was a watercolor, comprised of just three or four primary brushstrokes, showing one of the most elegant roosters I’d ever seen, with his head turned gracefully to look back over his shoulder. 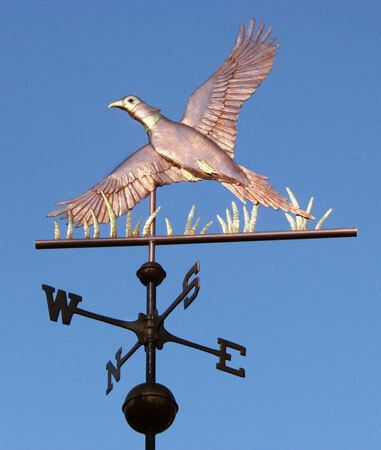 That painting ended up being the inspiration for this weathervane design. A whimsical variation on this design is our Rooster with Cocktail. Of course, because all of our designs are made to order, you could personalize the design and change the cocktail for another design element; a mouse or a butterfly would be cute. 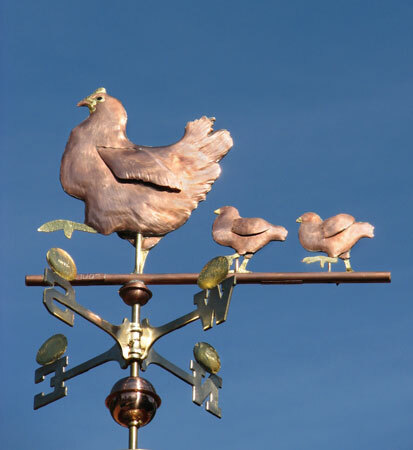 Because we specialize in custom copper weathervanes, we can do different breeds of chickens, depending on our client’s preferences. 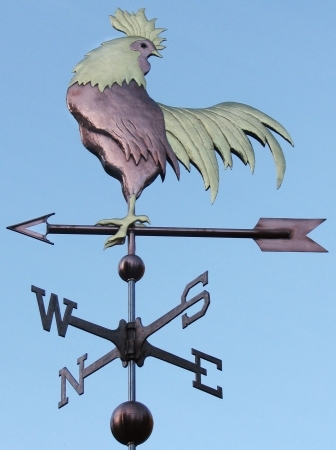 For example, in addition to our traditional roosters, we crafted a Phoenix Bantam Rooster Weathervane for a breeder. Phoenix Bantam roosters can grown tails that are up to six feet long! 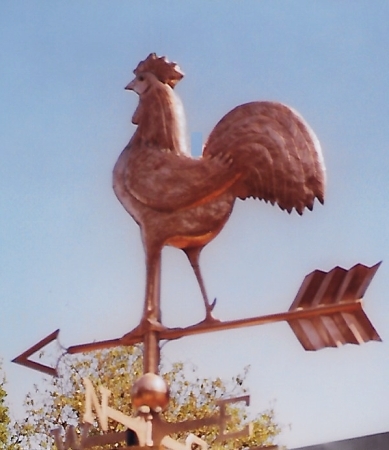 The customer who commissioned this weathervane ordered it in the small size and put it on top of her chicken coop. We could certainly do other chicken breeds such as Ancona, Araucana, Leghorn, Rhode Island Red, Delaware, Cuckoo Marans, and Plymouth Rock, to name but a few. 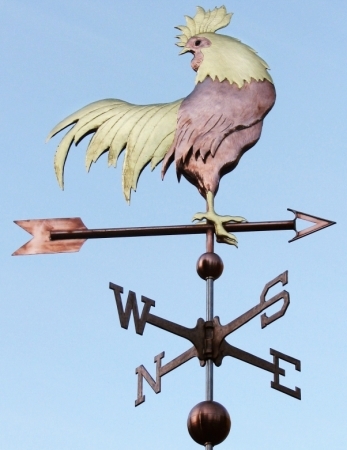 If you have a favorite breed of chicken you’d like made as a weathervane, we’d love to discuss your ideas with you.